Ansca Mobile is the great company behind the Corona SDK with which I programmed GalaxiTaxi. If you are an Indie Developer or just plain interested in coding with a great language (LUA) you can download it and test it for free at their website. It is easy to get into and a very rewarding experience. I learned the language, did all the assets and programmed the game in just 4 months! The Corona SDK from Ansca Mobile. I stumbled upon this great development kit as I searched for means to build an iPhone/iPad game. The Corona SDK allows for instant fun with coding as it is really that easy to understand. I downloaded the trial version and was amazed by the possibilities it offered. The only thing I could not do with the trial version, was to actually build for the Apple Store! I could even built directly on a device (Apple Developer ID is still needed of course!) which is very rarely included in trial versions. I was skeptical at first as I had tried quite a few SDKs from different studios but when I finally tested it, I had an iPhone simulator screen running with a “Hello world!” in just a few seconds. This screamed “wow!” all over it. The programming language used is LUA (V 5.1) which is very easy to understand and is ideal if you have none or just basic understanding of programming. Sure C# or Objective C might be more powerful, but they are quite a hurdle to overcome if you start fresh out. I tried some of their code examples and learned the language really quick by just trying out some things. It uses Box2D physics and is mainly targeted at an audience trying to do 2D games with physics although even “boring” apps like calenders and the like can be done. I decided I wanted to do a small game project before I try something bigger and came up with the idea of doing a gravity based game like Spacetaxi. I had some artworks from an unfinished project with some cute little aliens and I always liked space taxis. I wanted to go “bottom up” with this, so I really built the game as I went not planning greatly ahead. I improve GalaxiTaxi on a daily basis and if I am not satisfied, a feature may get overhauled or dropped entirely. I love working on my own – nobodies work is wasted but mine. Looking through the list of third party tools for Corona I found two that proofed to be perfect: The first was Particle Candy and the second was called Lime (and whats better than a corona with lime? ;)). 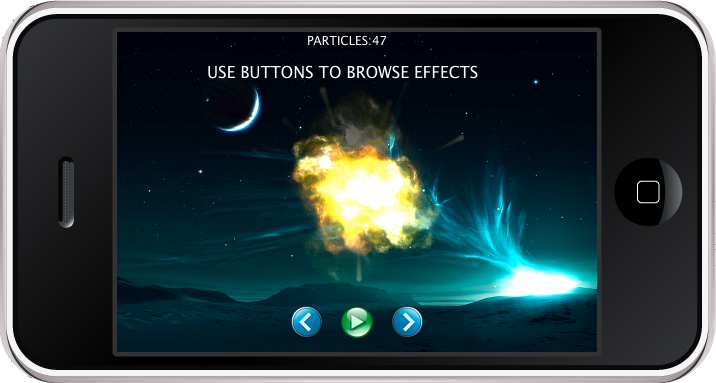 Particle Candy is a very well done particle library which offers physics particles and many other effects. I always liked particle effects as they cost so much less processing power and are more flexible than animations (for explosions that is). It is easy enough to understand, but it could use some kind of editor for quickly perfectioning effects. But since Corona is interpreted it can be told to automatically restart everytime any assets are changed in the project folder. So that is no big issue. Lime is really amazing. 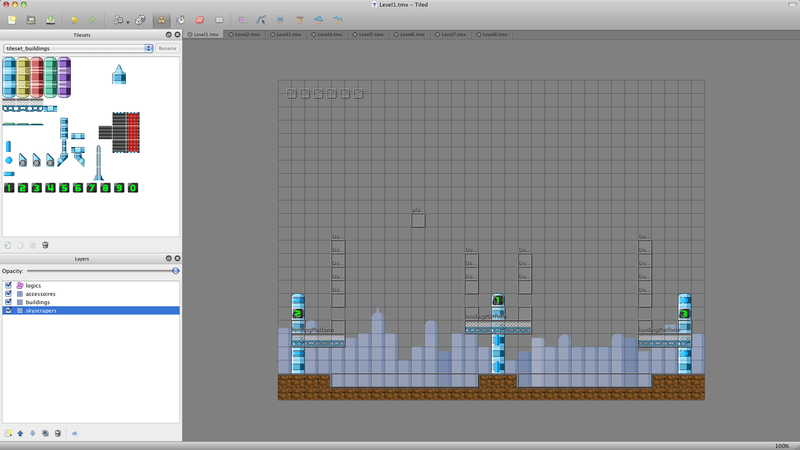 It is a tile-based editor library for Corona which uses tilEd made levels and reads them in for Corona. Its creator Graham Ranson is a really nice person and quick to respond on any questions I had. Lime works as advertised and is a big helper when it comes to loading in levels which can be hold a lot of information for the game. This makes it possible to give tasks to a level designer who has great possibilities on changing values and keeps the programmer from doing this. Especially for one person developers this proves to be an enormous plus as I can write the code once and load in any level I design. The TilEd (V 0.8) editor is a tile based level editor that still has some issues with reloading assets and sometimes needs to be restarted, but overall it is a good enough tool for something that does not cost a penny. It surely is better then writing XML tables by hand. It can be used with a lot of different platforms and operating systems. That’s it for today. I hope you found something new and worthwile to read and next I will show you how I built a level from scratch.